In some of the most recent creatures under “M,” I am having difficulties visualizing the creatures. I know I could pick up a copy of the Cyclopedia but even google images are coming up short. Are there physical descriptions or lore based write ups centrally located anywhere else but the book? If not, I’ll probably try to pick up a copy. Seethyr wrote: In some of the most recent creatures under “M,” I am having difficulties visualizing the creatures. I know I could pick up a copy of the Cyclopedia but even google images are coming up short. Are there physical descriptions or lore based write ups centrally located anywhere else but the book? If not, I’ll probably try to pick up a copy. Neither the Mujina (from the Dungeon Master's Companion) nor the Mek (Master Set DM's booklet) were illustrated in their first "appearances," however, they were illustrated in the 2ed Mystaran Monstrous Compendium appendix. Thanks for answering that one, RobJN. I didn't know where illustrations could be found. I don't know why but I've been worried about copying text from the RC here. I probably shouldn't be, and just copy over the descriptions at least. Hugin wrote: Thanks for answering that one, RobJN. I didn't know where illustrations could be found. I had always assumed that you didn't copy the descriptions in your conversions precisely for that reason. I have the RC, but I don't have a complete BECMI set, nor the "Mystara" MC mentioned above, so there will be monsters I will not have descriptions of if I rely solely on this thread. Then again, googly & wiki are powerful tools. I will not be offended at all if you use my work for inspiration, for comparison, or if you go in a different direction entirely. Thanks for the info, pawsplay, but this whole project is really about the creation process for me and much less about just getting them done. It's the journey that I'm enjoying, and the destination simply represents a layover before the next journey. Spear. Melee or Ranged Weapon Attack: +4 to hit, reach 5 ft. or range 20/60 ft., one target. Hit: 5 (1d6 + 2) piercing damage, or 6 (1d8 + 2) piercing damage if used with two hands to make a melee attack. Last edited by Hugin on Fri Oct 05, 2018 4:53 am, edited 1 time in total. Would rely like this as a PC race option. However looking at closely it is a bit bland for that. To be fair you did not intend these to be PCs. Canon PHB races are built with 12pt. 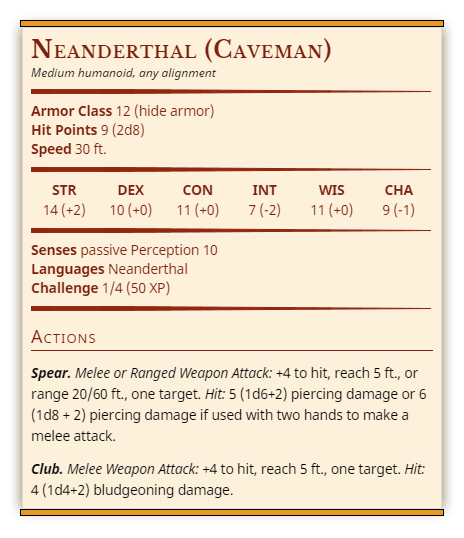 Neanderthal weapon training: Proficient in spear (0) and club (0). Nice, Coronoides. I haven't experimented with playable races yet, so it's good to see done. I thought about adding in some creative elements but again, taking the example of the Tribal Warrior, decided to go the simplistic route. Now that I think of it, I'd get more creative with some leaders or hardened warriors. But on the other hand, they are described as being relatively non-aggressive. Last edited by Hugin on Tue Jan 30, 2018 3:29 am, edited 1 time in total. Coronoides wrote: Would rely like this as a PC race option. However looking at closely it is a bit bland for that. To be fair you did not intend these to be PCs. I find some of your ideas for ablities very interesting! If we want to consult other BECMI sources, the Hollow World Boxed set includes rules for PC "Brute Men", which are probably based on these Neanderthals. That set gives them a bonus to Con (+1) and a penalty to Int (-1). They also get superior hearing, can never be ambushed, and can detect hidden doors if concealed to look natural. I kinda like your take better than I would a more direct conversion. Multiattack. The nekrozon makes one tail attack and uses Death Gaze if available. Hit: 7 (1d8 + 3) bludgeoning damage. If the target is a Medium sized creature or smaller, it must succeed on a DC 14 Constitution saving throw or be knocked prone. If the saving throw failed by 5 or more, the target is also stunned for 1 minute. The target can repeat the saving throw at the end of each of its turns, ending the stun effect on itself on a success. Death Gaze (Recharge 5-6). The gaze of the nekrozon is a magical gaze of death. 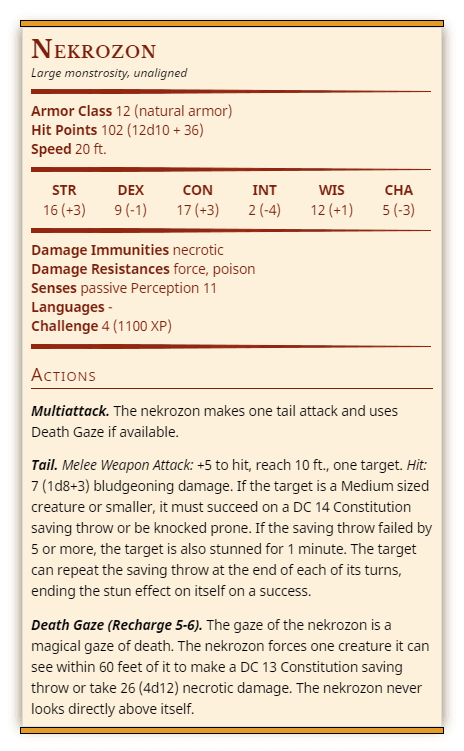 The nekrozon forces one creature it can see within 60 feet of it to make a DC 13 Constitution saving throw or take 26 (4d12) necrotic damage. The nekrozon never looks directly above itself. The dreaded Nekrozon is so much more awesome than the Catoblepas in other editions. Its good to see it converted. Is there a difference between the two creatures in prior editions? The 5e catoblepas looks quite a bit different and I was thinking of using these stats for a tapir-like version. They are actually pretty similar rules-wise. BECMI's version are called Nekrozon, but the name Catoblepas is mentioned in the description as not currently in use. BECMI's version has 7HD, while the AD&D 2nd Ed version has 6HD. The BECMI description states that the creature has a long neck, but the accompanying Jeff Easley illustration (which I provided above) seems to have ignored that. My personal visualization of the monster has always been influenced by Easley's take. So I know it is about RC monsters, but could I get an add to the list? I did a quick conversion from BECMI to 5e for the Aranea? I do not believe my conversion skills are quite at Hugin level. Found in X1 and i believe later in AC 9 (pg 60). I finally made it back to The Piazza to catch up on some reading. While we've emailed a few times I bet others were wondering what happened to me. Well, as you know, things got crazy busy as we moved our office into our brand new permanent building... smack-dab in the middle of one of our busiest times of the year. Go figure. Anyway, I'll be returning to this project soon(ish). I've been working on the Nightshades in spare moments and they're pretty involved. I've done that as well, makes life interesting. Its great to talk to you, I hope we see you back here soon. I tried my hand at the aranea, and i think i emailed to you to see if we would match. If we are close, I could post other BECMI monsters that I am/have converted. Incidentaly those of you having to convert on the fly, the following rule works surprisingly well in a pinch. I found these online, I think from WotC. •	If a creature has to make a check or saving throw, and should be good at the roll, use the creature’s (HD/2) + 2 as a bonus on the roll. Otherwise, use no modifier, or use a penalty to reflect something the creature should be bad at. What I have had to do is make up some of the more special attacks for monsters, hitpoints vary vs 5e sometimes higher sometimes lower, I have gotten better at changing those as well to better reflect the challenge that should be presented. Worked well on wandering monsters and those not listed in this thread so far. I will be back, BotWizo. Well, I never really left - it was just an extended nap in the corner. Our office move is done, we're catching up on work, and I'm itching to get back to some converting! My OP's linked index is all broken. Looks like the table code is not working. I'll figure out something eventually after tax-season, our crazy-busy time of the year, is over. Any ideas are also welcome. Sorry to hear you haven't got back in the saddle for this awesome project, Hugin. Hope everything is well. Thanks for popping in to see where things are at. Everything is well on the personal side of things, however the breaking of the table coding on the forum broke my spirits somewhat. They're working on a fix, though. I think I was a bit burnt out, time was getting scarcer, and the tables breaking was the proverbial straw. Over the summer I have been working on my campaign world from scratch and that has occupied most all of my D&D time (other than playing a bit). However, I will come back to this again at some point. And I think your post has re-kindled a spark of desire to return to this. FYI, the Mujina first appeared in module X5: Temple of Death, and there is an amazing illustration of one there (by Tim Truman). I'm glad to hear that Hugin. I've been off-n-on the internet for so long, I lose track of things - and the Piazza forums was one of those sites that I lost temporarily last spring. I hadn't realized the switch that was at the heart of the table functions not working any longer - until you mentioned it. That is a big obstacle to continuing your project, & I hope there is a work-around coming soon. I completely forgot about the gorgeous art in the module. A truely faceless enemy! And I certainly agree - that is a great illustration.